Power pole replacement comes into the category of work we are qualified for as a Level 2 Service Provider, and we are the contractor to call should you fear anything going wrong with them. Dave Fenech Electrical are not only qualified to carry out maintenance and other work on Level 2 Services – those which start at the street and connect to your home or office – but we specialise in them. We have built our business around providing these much-needed services with maximum expertise and safety across Sydney. We are a level 2 electrician servicing all areas of Sydney. We have the specialised experience, tools, and practices to safely repair, remove or replace steel and timber power poles. Our goal at all times to be having your electrical service restored to full capacity as soon as possible. Our teams of licensed electricians work safely at all times to avert any crisis quickly, so you can get back to living your life worry-free. Level 2 Services cover a broad variety of work, and the team at Dave Fenech Electrical work hard to always be prepared for any sort of job which comes up. In addition to our direct work on overhead lines and power poles, we will happily come and inspect the installation of your electrical services to ensure they meet current standards, or provide temporary infrastructure should your situation require it. We also cover work related to underground power lines, with our staff ready and trained to carry out this work in a safe and considered manner whenever it’s needed. Once we are done with your power pole replacement we will remove and dispose of the old pole for you. It is your responsibility to take care of any power poles that are located on your property. You must make sure that all vegetation is cut back and that the pole is properly maintained to keep the pole from being damaged. If your pole is damaged your will need power pole replacement. To take proper care of your power pole, it is important that you make regular checks to make sure there aren’t any defects. 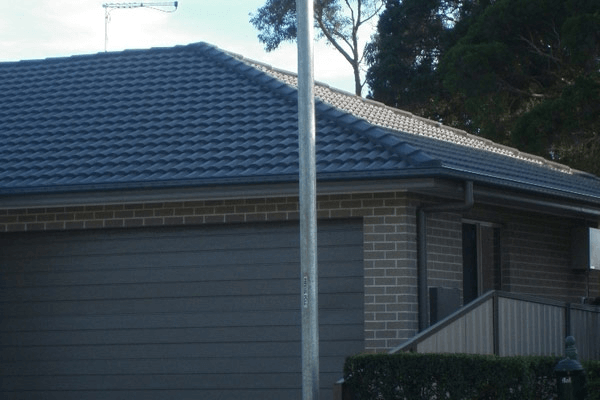 If you notice that a pole has any of these defects contact us or call on 9833 9566 and we can perform a thorough inspection. We can rectify your electrical pole defects and any other electrical defects that you may have. If needed, we can provide you with power pole replacement. 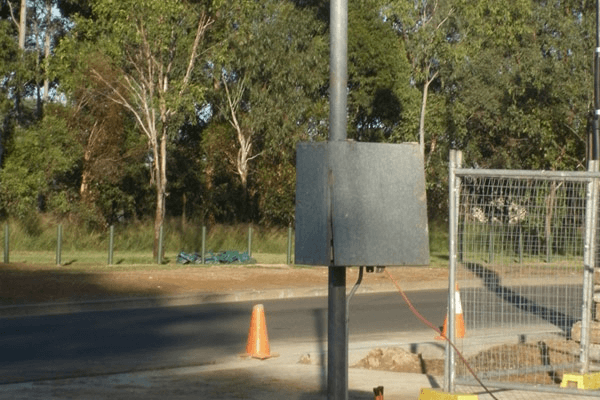 Dave Fenech Electrical Services Pty Ltd also provides temporary pole installations. The pole can be installed, and the switchboard will be mounted directly on it. Then, we will connect it so the site has power. Once you are done with the temporary service, we will come and remove the pole, overhead service and switchboard. 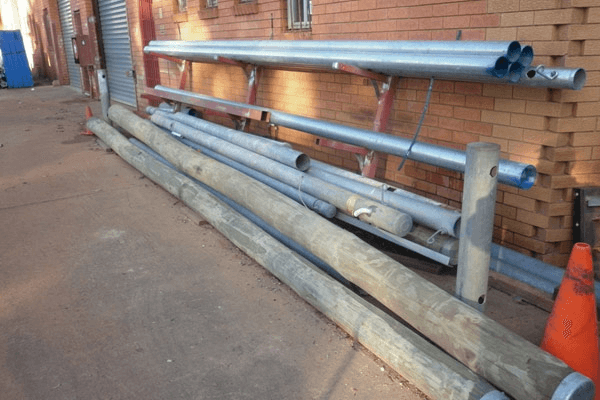 Galvanised steel poles and treated hardwood poles are the two types of poles that you can choose from. Each type of pole has its pros and cons. It is important to take into consideration this information so that you can make an educated decision on what type of pole will be best for your specific situation. Galvanised steel poles are more aesthetically pleasing and can be painted to match their surroundings. They usually last around 15 years which isn’t as long as treated hardwood poles. Steel poles are prone to rust, so they must be inspected on a regular basis. Treated hardwood poles are not as aesthetically pleasing as galvanised steel poles. They do have a fairly long lifespan which is usually around 30+ years. If you live in a coastal area, they might not be the right choice for you since moisture content can shorten their lifespan. They also are not recommended for areas with active termites. Dave Fenech Electrical have been solving Sydney’s electrical problems for over 20 years. So, we know how important it is to move fast in our line of work. Our office is constantly staffed and ready to take your calls. With teams of accredited electrical workers ready to travel to your location. You can expect that all the work we do will be consistent with the highest standards of quality possible. Get a free quote for your power pole replacement via our contact form or calling (02) 9833 9566 today.